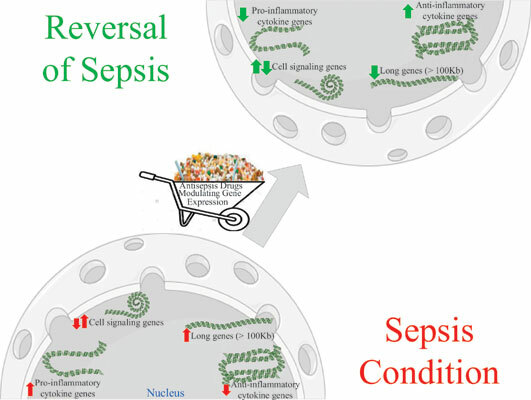 Sepsis is a debilitating clinical syndrome of systemic inflammation in response to microorganisms especially Gram-positive and Gram-negative bacteria. A minority of sepsis cases could be due to non-pathogenic insult such as trauma. Much of the tissue and organ injury observed among septic patients is a consequence of the inflammatory response. The search for effective treatments of sepsis has led to several studies by different research groups across the globe. Although many targets and molecules have been identified, there is still no effective treatment for sepsis. The aim of this report is to review the literature on drugs and drug candidates against sepsis and how they modulate the expression of inflammatory genes. Many compounds have been identified to regulate inflammatory gene expression by interacting with targets such as topoisomerase 1 and nuclear factor kappa B, which regulate the production of pro- and anti-inflammatory cytokines. Even though these compounds appear promising as potential drugs against sepsis, no effective therapies have been discovered to date and thus the fight against sepsis continues. Sepsis, drug candidate, gene regulation, inflammation, NF-kappa B, macrophages.